Google has just added some handy customizable swipe actions to its Gmail app for iPhone. 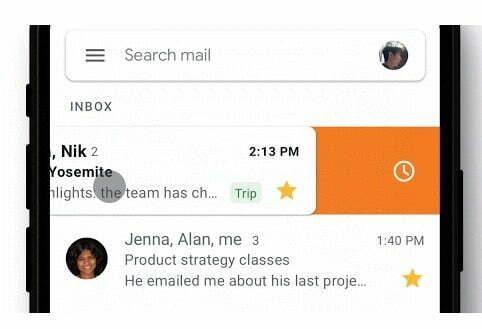 The feature, which has been available to Android users for nearly a year, gives you a lot more options for when you swipe an email, helping you to organize your messages far more quickly. Before the update, Gmail on iPhone only gave you the option to delete an email when you swiped it. Now, you can perform all of the following: Archive, mark as read/unread, snooze, move to another folder, and, as before, trash. The swipe configuration settings can be accessed by going into the Gmail iOS app and navigating to Settings > Swipe actions, and then choosing the swipe options that work best for you. Google says the new customizable swipe actions are starting to roll out users from Thursday, March 28, though it could take up to a couple of weeks for the feature to land for everyone. The addition of the improved swipe feature for iOS comes a couple of months after the web company launched a new look for its Gmail app for both Android and iOS users. The revamped design uses fewer colors for a simpler interface, making it easier to focus on your Gmail content. It also offers a more straightforward way to view photos and other attachments after doing away with the need to open them or scroll through the conversation, and it’s now easier to switch between personal and work accounts for faster access to all of your messages. The new look also replaced the search button with a more prominent search bar at the top of the display, and for security, prominent red warnings show up if the app spots anything suspicious in an email such as links that you may want to research before tapping on. Digital Trends has more information on the new-look Gmail for mobile.